Our next annual dinner is planned for Thursday the 16th of May 2019, location and speakers are yet to be confirmed. To reserve a seat or a table, or if you have any other queries, contact Grant Hodgson. Ian has been a member for 20 years and recently joined the Cumbria section. He served his apprenticeship as an Instrument Artificer at ICI . He worked for some Instrument manufacturers, and is now an RE at Sellafield . Grant joined the Cumbria Section Committee in 2015. Having worked in various maintenance and electronic engineering jobs around the Sellafield site, Grant became an SL employee in 2007 where he spent 5 years in maintenance and then 5 years in System Engineering. He now works in Design. Dave has been on the Cumbria Committee since 2010. He started his career at Sellafield as a Instrument Technician Apprentice, and has moved through Maintenance Support, Pre Ops and Design before taking on his role as System Engineer Plant Wide Systems in one of the sites main priority buildings. Mike has been an active member of the Institute for the past 10 years . For most of his career he has worked on the Sellafield Site. Richard is a Project Engineer. Around 500 students attended Energus, Ian Reynold and Grant Hodgson manned the Institute stand this year, talking to enthusiastic potential future engineers about how instrumentation and control effect their daily lives, from pouring there co-co pops and traffic lights, to Formula One car telemetry helping teams to push their car forwards. The honour fell to Grant Hodgson this year to present our student of the year award. 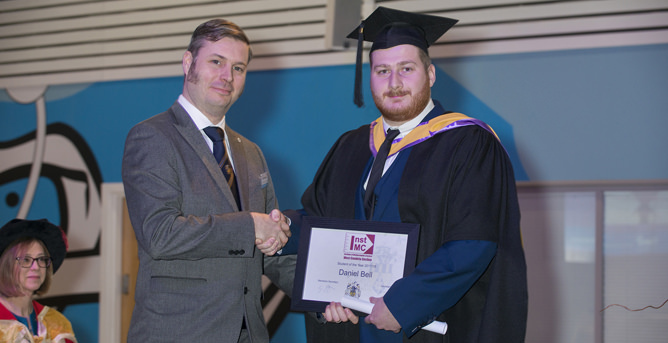 The winner this year was Daniel Bell for his degree in Plant Engineering. Applied Photonics Ltd is a UK company specialising in technology based on Laser-Induced Breakdown Spectroscopy (LIBS). Already involved in testing explosives with the US military, they are currently carrying out testing of dust particles in nuclear filter systems.